It is hard to say when our trip across the country really began, when we locked up the house in Maryland or when we left the family in Fredericksburg. We flew back from California to get our car and drive across America in a more or less leisurely fashion. The three days we had from the time we landed to the time we went to Fredericksburg were a riot of activity. In addition to getting everything we thought we would need for the trip and fixing up the Maryland house for our absence until November, we took a day to drive up to West Virginia to say goodbye to friends and to transport some belongings out of our Lost River home we recently sold. Our journey to the family was the worst trip there in over a decade of travel to the place. In one sense it was uneventful. Unfortunately, this translated into the fact that for much of the time we weren't moving! I took three hours to go 50 miles. Once there it was great to see everyone but less great to say goodbye until November. The next morning we headed for the first stop on the cross-country trip, Greenbrier. Everybody who lives in the Washington Area has head of the Greenbrier. We had never been there. It is a resort, like the old Pocono Mountain retreats popular years ago in Upstate New York. After our experience of the day before, I was anxious to get underway. The trip was scheduled to take 4 hours with no stops and no traffic. The family was betting that we would get there before lunch. No traffic, fortunately. We stopped at Charlottesville for lunch and for a break. The Cadillac is a great car to drive but it cramps my left hip if I drive for more than an hour or two. 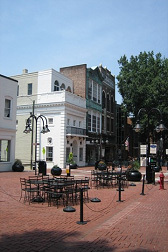 Charlottesville is one of those cities that Hs turned it old downtown into a pedestrian Mall. Although we have seen examples of where this strategy did not work, it was busy on the Sunday we were there. The scenery from Charlottesville to Greenbrier is very dramatic, rolling hills and valleys that stretch for miles. Even though it was foggy the views were spectacular. Greenbrier is hard to describe. It is big, old, luxurious, friendly, expensive (very, the same cup of Starbucks coffee is three times the cost), old fashion, modern, etc. It has on the property facilities for hunting fishing, riding, golf, tennis, hiking, horseshoes, croquet, and other activities designed to keep families entertained for days at a time. It is like a luxury cruise ship except that it is on land. The place has been here so long that it was the original summer White House for a half dozen Presidents (pre-Camp David) and is the site of the secret retreat for Washington big-wigs during the bomb shelter era. The next leg of the trip was a long drive. Fortunately on a single highway. After a couple of hours we stopped at Charleston West Va. Lots of towns have gentrified their downtown areas with varying success. Charlestown is an example of one that did not work. We had been in this City a few years ago when we took a trip around West Virginia. The downtown revitalization was on the decline then. Now, even at lunchtime on a working day, it was deserted. We proceeded on for an hour or so before we stopped for lunch at Huntington. Huntington is another city that is trying to bring back its downtown but appears to be having more success. It was alive and busy. The countryside in southern West Virginia is pretty, dramatic like the West but greener and softer. We finally arrived at Lexington, Kentucky. We had a time finding the hotel. It is an old (really old - so old the sewer pipes leaked giving the entryway an interesting and unique charm). The City is small and closes at five. We found a restaurant and drank supper - the food was not too great. After dinner we went to an outdoor concert. Not quite on a par with the concerts on the Mall but small-town America's version of the same. It could not have been more patriotic. One gets a real sense of a place and people that is very different from Washington or California. The Red states are a different country. Interestingly, almost every brought their own chairs for the event. Well, almost everyone. The next day we searched out a breakfast place (Starbucks no less). In trying to get back to the hotel we found that the whole downtown had been cordoned off for festivities. In fact, there was a marathon run separating us from our hotel. We took a trip out of town to see the Bluegrass Country. Mile after mile of horse farms. Pretty much like Middleburg but flat - except that the manor houses tend to get out of control. Look at Castle Farm. Carol also wanted go see a distillery. Unfortunately, all of the plants were closed on the Fourth of July but we got to see the outside of one anyway. Driving back, I spotted a roadside shop that sold chocolate and bourbon candy. Guess who thought that this combination was great! The last activity of the day was the parade. What can I say - a small town, 4th of July. I am off to the coin laundry for the final excitement of the day. Travel Hint: Do not eat raw vegetables or salad in Third World countries or in the South.